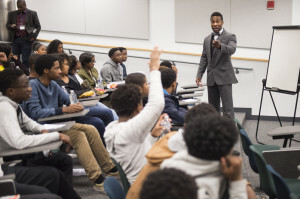 Daon McLarin Johnson, leader of an organization that mentors young men in the Washington, D.C., area, speaks during a "Race and the Law" forum. More than 50 such events are scheduled across the nation in the first three months of 2017. Daon McLarin Johnson, leader of an organization that mentors young men in the Washington, D.C., area, speaks during a “Race & the Law” forum. More than 50 such events are scheduled across the nation in the first three months of 2017.